Nothing beats real deal campfire s’mores, but they’re not always convenient to make. Lucky for us all, a bunch of baking genius types have created s’mores-inspired cupcakes, candy, cookies, and bars. In fact, I baked some s’mores brownies not too long ago. 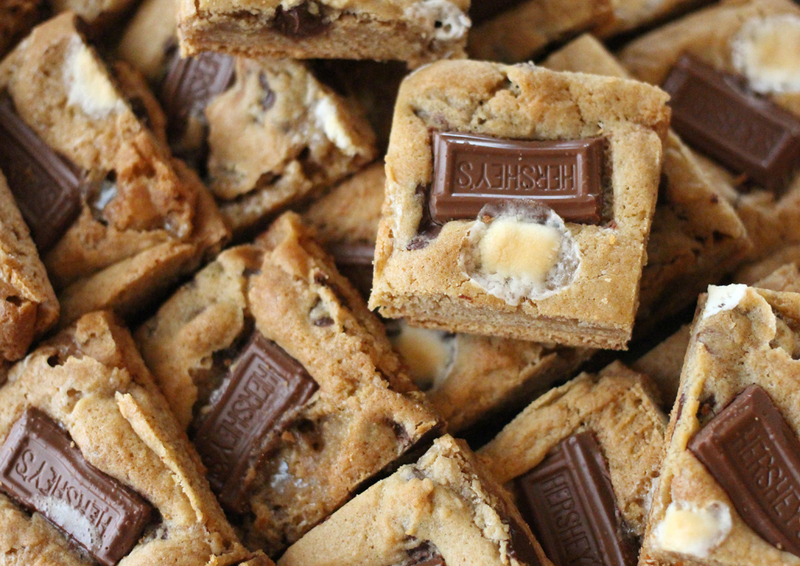 For anyone who wants a little less brownie, a little more cookie, and a little less messy to eat than those brownies, this cookie square recipe is perfect. The recipe is posted at the end of this post. And semi-sweet chocolate chips are mixed into the batter along with the mini marshmallows. The bottom of the cookie bars is where the graham crackers come in. You’ll line a baking sheet with parchment paper (very important to avoid burning) and arrange the graham cracker squares very close to each other. I placed my graham crackers upside down so that the bottom sides were facing up. This is absolutely not necessary, but does let you cover the more unfinished side with dough, leaving the “pretty” side of the graham cracker facing the outside. Do people look at the bottoms of cookies or bars before eating them? I definitely do. Am I the only one? 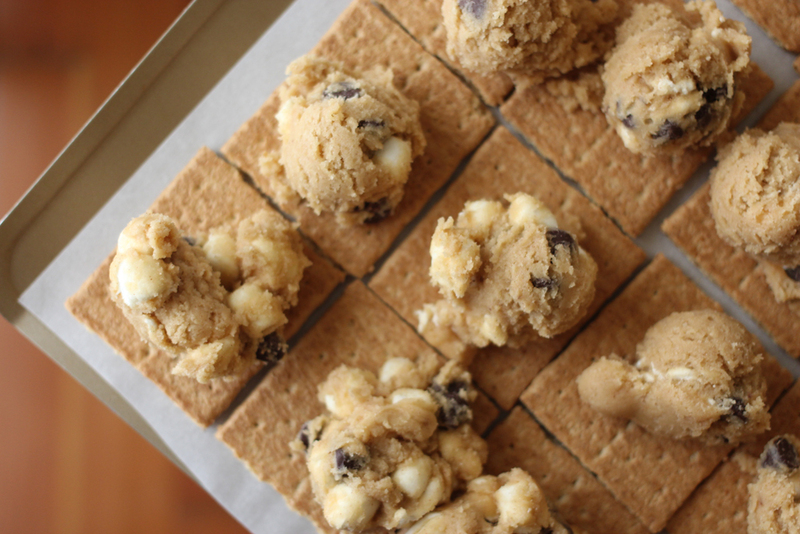 Don’t be be shy when topping the graham crackers with the cookie dough. I made 30 squares when all was said and done. 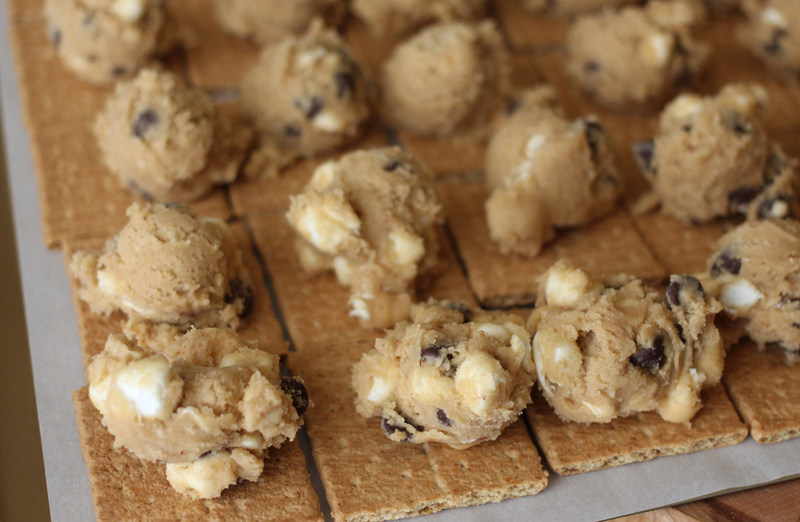 You can use less dough per square and more graham crackers if you prefer thinner cookies. I made these a few times and prefer the slightly thicker ones like I made here. 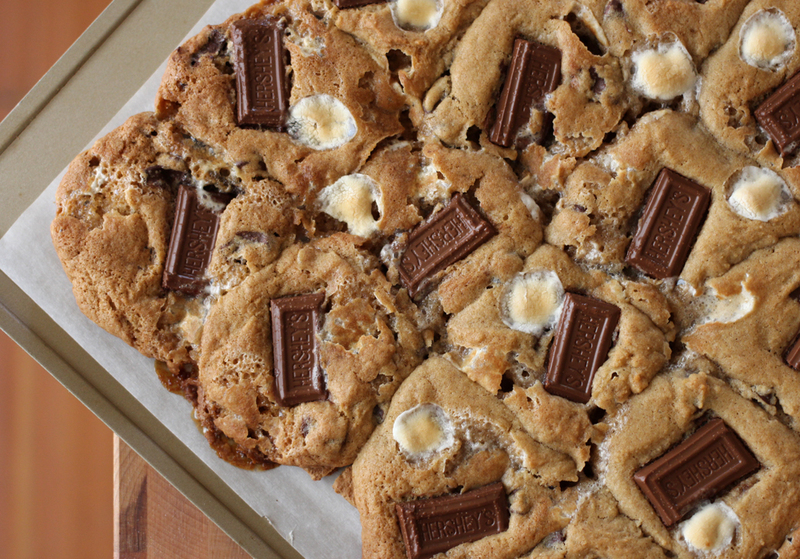 After five minutes of baking, remove the half-baked cookies from the oven and add on the Hershey’s pieces and extra mini marshmallow. The marshmallows that are already mixed into the dough tend to get baked and melty and won’t be visible. 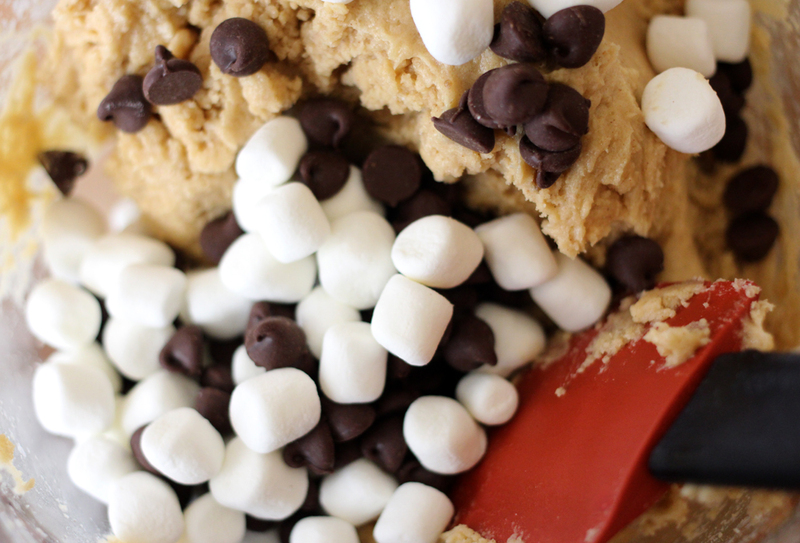 It’s not necessary to add more marshmallows on top at this halfway point, but these visible marshmallows help people know immediately what’s going on inside the cookie bars too. After the cookies squares are totally cool, use the sharpest knife you have and cut them into squares. 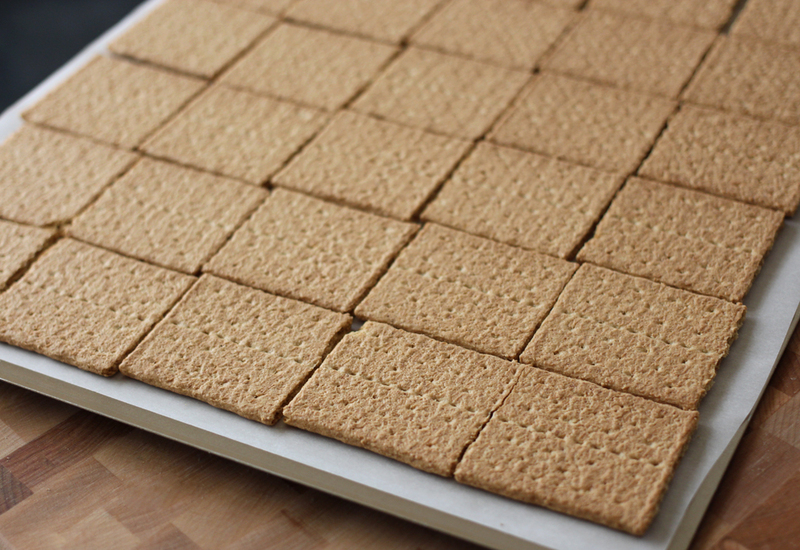 Line a large baking sheet with parchment paper and line graham crackers squares across the entire surface, making sure there are no space between the graham crackers. Set aside. In a medium bowl, whisk together the flour, baking soda, sea salt and cinnamon. Set aside. Place the butter and sugars in the bowl of an electric mixer fitted with a paddle attachment. Cream the butter and sugars on medium-high together until light and fluffy. Add in the eggs and vanilla extract and mix until it’s all combined. Turn the mixer speed to low and slowly mix in the flour mixture until combined. Fold in the chocolate chips and mini marshmallows. 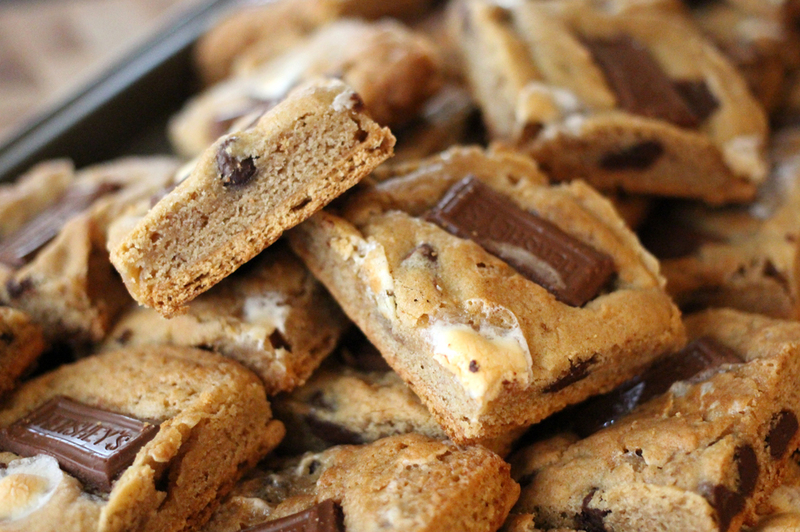 Fold in the chocolate chips and marshmallows. Once mixed, scoop a heaping tablespoonful of batter onto the center of each graham cracker square. Place the entire cookie sheet with graham crackers and dough into the fridge for about an hour until the dough chills. When ready to bake, preheat the oven to 375 degrees. Remove the the cookie sheet from the fridge and press the dough down slightly. 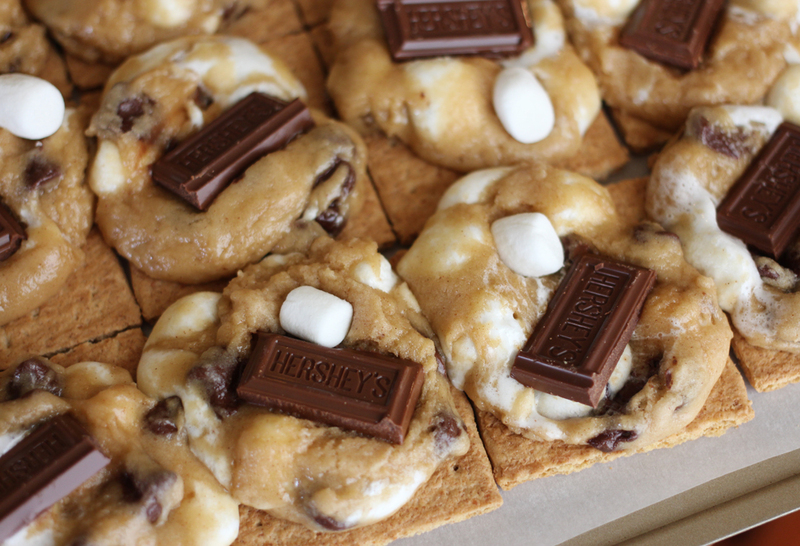 Bake for 5 minutes, then remove from oven to press Hershey’s bar pieces and extra mini marshmallows on to the top. 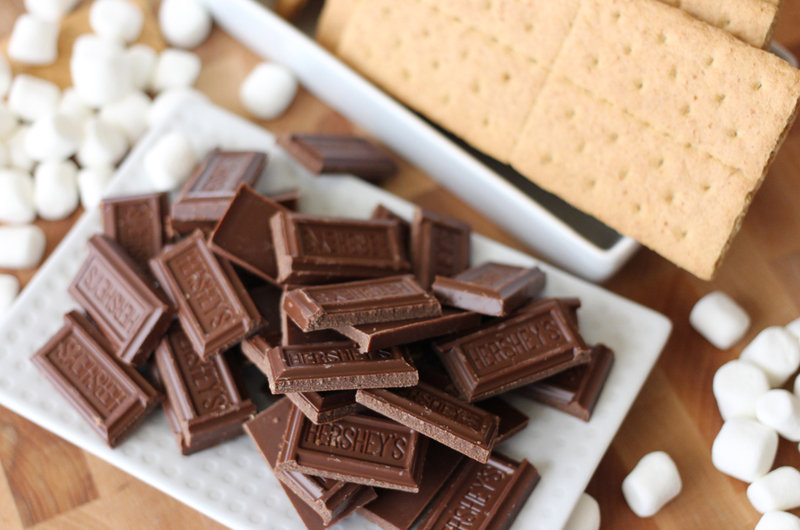 You can place as many pieces or as little as you want depending how much chocolate flavor you want. Bake for an additional 5 to 7 minutes. The cookie squares will be done when the edges begin to turn golden brown. Remove to a wire rack to cool. For clean cutting make sure cookies are completely cool and cut with a super sharp knife. Yup, I’ll be making these!